Dallas, TX—Those darned Golden Retrievers! They get all kinds of fan time, edging out other equally worthy breeds—like, say, Australian Shepherds. Scout (left), an Aussie belonging to Laura Kosann, daughter of jewelry designer Monica Rich Kosann, has wanted to have his picture in one of his grandmom’s lockets for a long time. But all the dogs he sees online in her Locket Bar are pictures of Golden Retrievers in the lockets. "Didn't I make her an Instagram star?" he muses. 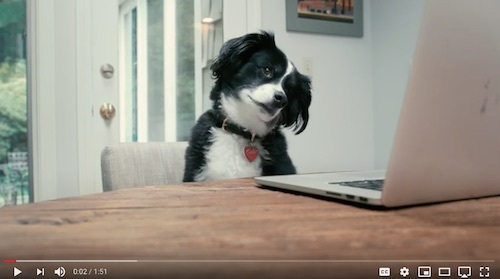 Disgusted, he plots to get himself noticed in this adorable Monica Rich Kosann brand video on YouTube. Click here or on the image below to watch. A locket and other jewelry by Monica Rich Kosann. Omaha, NE—The Edge Retail Academy (ERA) announces the release of its new “Retirement Readiness” program for retail jewelers. ERA has developed this unique program to fast-track a jeweler’s business to be ready for his or her retirement, whether that’s imminent or in the farther future. “Getting your business into the best possible shape before you decide what to do with it is what we call “retirement readiness,” says Brown. “You don't have to be ready to retire in order for your business to be retirement ready. We expect to have many participating jewelers who are years away from exiting their businesses.” Click here for more information about the Retirement Readiness program.